POKER has become the latest pub craze, but one of the game’s experts, Al Alvarez, will be sitting out the bar-room card schools. Mr Alvarez, the Hampstead author who has written books on poker, believes he would not be able to concentrate in pub tournaments. His comments came as a series of pubs began to hold group poker games – now permitted under recent changes to the Gambling Act. Mr Alvarez has been a serious poker player for more than 50 years. He took part in the Poker World Series, where players must put up a $10,000 “buy-in” for a place at the table. Poker, according to novelist Raymond Chandler, “as elaborate a waste of human intelligence as you could find outside an advertising agency”, is usually associated with lavish casinos or smoky back rooms. But a visit to the Royal George pub in Eversholt Street, Euston, on Monday evening, revealed the game being played amid muzak, football on television and a deer-hunting arcade machine. Conservative councillor Don Williams, head of licensing in Camden, insists only poker “of a light nature” will be played in pubs. 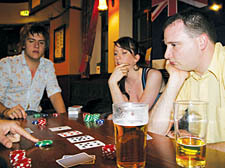 The Royal George, like many pubs turning to poker, favours a “sit-and-go” style of competition, in which players pay a set £5 entry fee, with the winner taking a percentage and the rest going into the pot for a tournament final at the end of the month. One of the conditions of the new law is that poker cannot be run by the pub for profit. Across town, the 3one7 bar, in Finchley Road, claims to be the biggest poker pub in the country, drawing up to 70 players on a good night. Professor Mark Griffiths, gambling expert at Nottingham Trent University, said: “The obvious concern is the mix between alcohol and gambling – the longer people drink, the less they can make informed choices.